Home Entertainment Is sitting down while playing bad for you? Is sitting down while playing bad for you? Are videogames ruining your life? Probably not: or at least not in the won’t-somebody-think-of-the-children sense usually suggested by the question. But there’s another activity that goes hand in RSI-crippled hand with playing games, and it’s more pernicious than endlessly worrying about your Hearthstone deck or getting too emotionally invested in The Sims. The problem, of course, is sitting down itself. The solution? It’s the same one favoured by Ernest Hemingway, orchestral conductors and Britain’s greatest ever wartime prime minister. But more on that in just a second. First, the science bit. Sitting down, according to most recent research, puts your body on standby. When you do it for long enough, your metabolism slows, circulation is constricted and connective tissue tightens. What researchers like to call ‘uninterrupted sedentary time’ is strongly linked to what researchers love to call ‘cardio-metabolic risk biomarkers.’ And while it’s bad enough to slump on the couch/office, gaming hunch is arguably even worse—whether we’re concentrating on spreadsheets or StarCraft, we tend to lean in, round our shoulders forward, squint and tense our facial muscles. Even an hour of sitting down can make your back—which tries its best to compensate for all the other stuff—measurably tighter. ‘Moviegoers’ knee’—the chronic joint pain that comes from prolonged contact between the femur and patella—is an officially recognised medical problem. Extended sitting has also been linked to increased waist size and cardiovascular disease. How to reverse the cost of years of sitting with a three-move, no-kit mobility session. Hunching forward ruins your posture—to fix it, stand a foot or two from a wall, lean back onto it, then push your elbows back to activate your scapula. Hold for five seconds, and repeat a couple more times. Bring one foot across your other knee, and hold it—if the stretch needs more intensity, lean forward. Bonus: you can do this one without even relinquishing control of the mouse. Yes, a chair one. 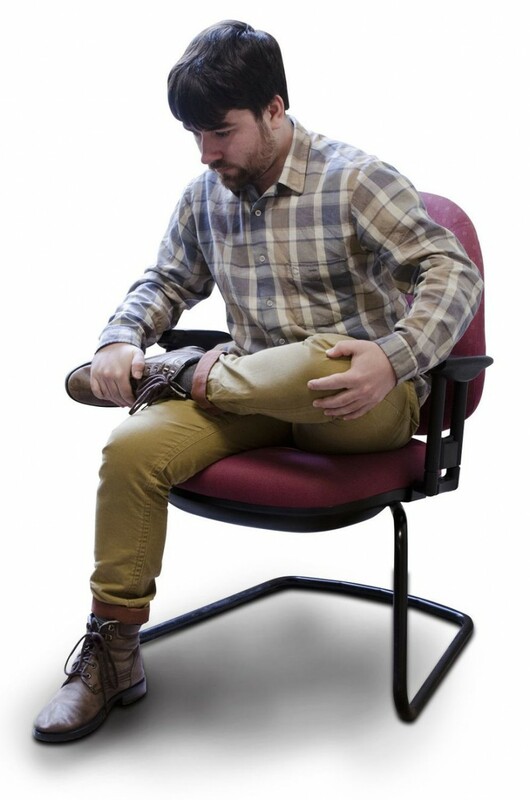 Put one knee on the seat of your chair (or sofa) with the other foot fl at on the floor. Bring your shin flush to the back of the seat, and lean back until you feel a stretch. So what’s to be done? To get the obvious answer out of the way, exercise alone is not the solution—studies suggest that it helps, but it doesn’t really mitigate any of the above in any serious way. And you can forget sitting on an exercise ball—studies show that muscular activation is largely the same whether you use a ball or a chair, and the greater contact area can actually lead to more soft tissue compression and ‘spinal shrinkage’. Studies on kneeling chairs, meanwhile, are thin on the ground, and a bit inconclusive. Also, kneeling chairs are awful. One solution, of course, is to stop ignoring the pre-game fine print and actually take screen breaks once every hour or so, perhaps wandering to the kitchen for an apple or a green tea. But that lacks elegance. And aggression. The real solution? Stand up. At least one study suggests that computer users who stand up for an hour during their workday have less back pain. Standing up also burns more calories than sitting down—about 1.36 more every minute, in fact, so over a two-hour gaming session you’re burning roughly the equivalent of a tall latte or a can of Coke. More importantly, it can also get your body back on track with regulating its glucose supplies, which helps you use energy from food more efficiently and reduce your chance of type-2 diabetes. Standing up has been linked to reduced risk of cardiovascular disease—the most famous study compared bus conductors (who stood) to drivers (who, obviously, sit) and found that the latter had a much higher chance of developing heart disease – and even to cancer, though why that’s the case isn’t entirely clear. But there’s one more issue to consider: cognitive performance. Standing up, you might argue, might work if all you have to do is fill in spreadsheets or bellow “Always be closing!” down your mobile, but what about if you’re involved in an intricate super-titan hunt in EVE Online? This is where things get a bit trickier—research hasn’t actually turned up much difference between sitting and standing, except in cases of elaborate multi-tasking—where sitting is, apparently, better (as an aside, working on a treadmill desk is much, much worse—multitasking study participants invariably end up stopping when they need to work on complex tasks). On the other hand, standing up to do creative work has a fine pedigree—Hemingway and Dickens both stood up to write, and Winston Churchill did a lot of his work standing up… at least, when he wasn’t conducting meetings from his bathtub, and Michelangelo and Da Vinci did some of their best work standing up. 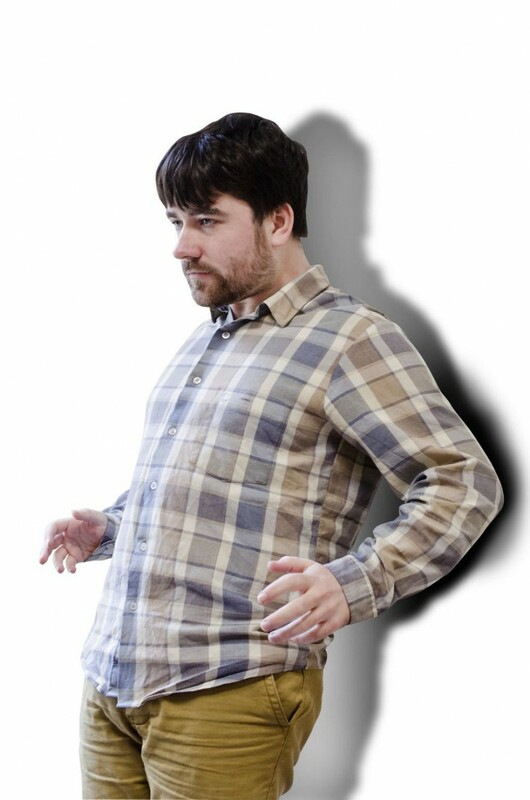 This isn’t surprising: regular practicers report that standing up makes them more assertive, more energetic and ever-so-slightly more dynamic—not ideal for dealing with the multi-tiered complexities of stopping Sims from wetting themselves, perhaps, but absolutely perfect for firing up your synapses during a lunchtime game of Search and Destroy. So: where to start? Crucially, going from endless sitting to non-stop standing is not the way forward—your body won’t be used to it, and anyway, as discussed, standing all the time isn’t productive. Mercifully, most modern standing desks are adjustable—flashy versions come with an electric motor, while cheaper ones offer adjustments via hand-crank. Most experts recommend starting out with a 1:1 sit/stand ratio to kick off with, adjusted as you get used to the new experience. Do it by game, or even by part of game—sitting down for when you’re re-ordering your deck or your inventory, standing up for when you’re leading the charge across Nuketown. Sitting for organisation, standing for aggression. Sitting for thinking: standing for commanding. Do it today. Churchill would approve. Considering a standing desk? Check out Evan’s experiences after a year playing games with one. Previous articleIs the ad-blocking Brave browser too good to be true?